Through the Stover Scholars Program, students have an outstanding chance to understand the U.S. Constitution, to witness the workings of government, to prepare for the responsibilities of leadership, and to benefit from a generous scholarship. Although the program focuses on issues related to history, government, politics, and policy, it is open to students in every major and can provide a strong preparation for virtually any professional calling. 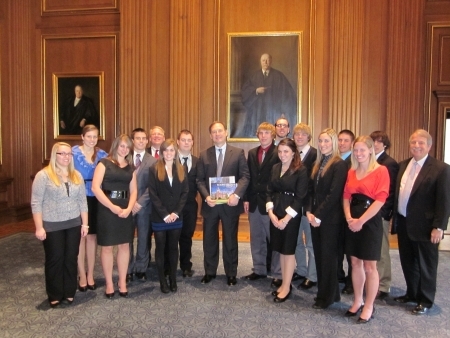 As soon as Justice Alito walked into the room, I was in awe. I felt I was a part of history. Discover the exceptional experiences the program affords—from discussions of depth and importance, to visits with some of the most influential figures in government. Get details on tuition scholarships, other forms of support, and program requirements. Find out about the promising young men and women honored as Stover Scholars. Read the thoughts of current Stover Scholars, faculty, and others. Learn about the kind of students the program seeks and how you can apply.